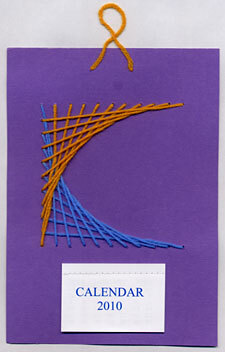 A curve stitching calendar project suitable for 7 to 10 year olds has been added to the Tutorials section of the Stitching Cards website. The project was created by my daughter Sonya, who is a primary school teacher, as part of a practical day held at the end of school term prior to Christmas. This is probably the wrong time of year to make a calendar but is something to keep in mind for later in the year. It makes a wonderful gift for children to give to their parents. The design is based on the pattern illustrated in the “From string art to stitching cards: a brief history” article, also in the Techniques section. The simple pattern is marked up with a pencil and ruler so will help children practice measuring skills and demonstrate how a curve can be created by a number of straight lines. It is stitched with knitting wool and a large darning needle so is suitable for youngish children.